Floyd Mayweather has hinted on social media that there is another boxing match scheduled between him and Filipino boxer , Manny Pacquiao. The two last duelled in May 2015 in what was dubbed a “Fight of the Century”. Despite all the hype around that 2015 fight, audiences and critics alike found it underwhelming. Mayweather won that match emphatically. Afterwards it was rumoured that Pacquiao had a shoulder injury before the fight, which was triggered during the fight hence the loss. To be noted though is, Floyd Mayweather, had a straight record of 47 wins with no losses. Therefore, him winning wasn’t out of the ordinary. Since 2015 Floyd has fought twice and lost no matches. Pacquiao has fought four times since the 2015 match and only lost once. Bookmakers have already stated what they expect the results of the fight to be. The odds in 2015 favoured Mayweather and three years later, they still favour him. In true, Floyd fashion, he has already began to trash talk Manny. Subtly suggesting that Pacquiao used a shoulder injury because he couldn’t admit defeat. Mayweather vs Pacquiao 2018: Fight of the Century? The 2015 fight between Mayweather and Pacquiao failed to live up to the hype. Largely due to the fact that it was not match with exciting back and forth punch and flair. Floyd was very technical and mostly defended blocking Manny from landing as many punches. True, it was the highest grossing fight, but the excitement value was on the lower end of the spectrum. 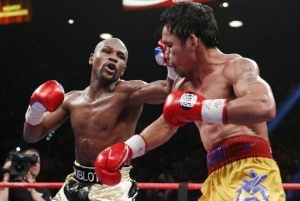 We hope that since Floyd Mayweather has beat Manny Pacquiao once on the global stage, he’ll defend less and attack more. We hope Manny’s shoulder injury issues are sorted before the big fight. These two men owe us the real Fight of the Century we have all been itching for.